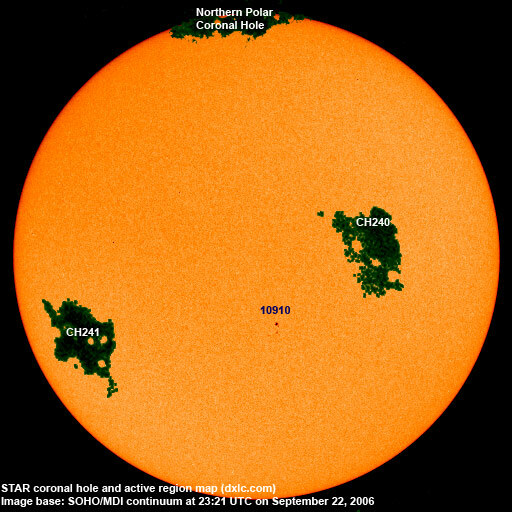 Last major update issued on September 24, 2006 at 02:30 UTC. The geomagnetic field was quiet to active on September 23. Solar wind speed ranged between 277 and 432 km/s (all day average 328 km/s - increasing 33 km/s over the previous day). A high speed stream from CH240 began influencing the geomagnetic field during the morning and slowly intensified during the day. The average solar wind density for the day is one of the highest recorded in SOHO history. Solar flux measured at 20h UTC on 2.8 GHz was 70.4. The planetary A index was 9 (STAR Ap - based on the mean of three hour interval ap indices: 9.1). Three hour interval K indices: 01211134 (planetary), 02222334 (Boulder). Region 10910 decayed slowly and was mostly quiet. September 21-23: No obvious partly or fully Earth directed CMEs were detected in LASCO imagery. 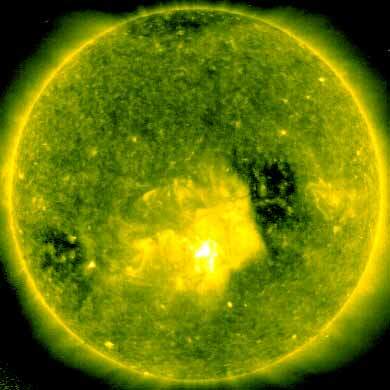 A recurrent trans equatorial coronal hole (CH240) was in an Earth facing position on September 20-21. 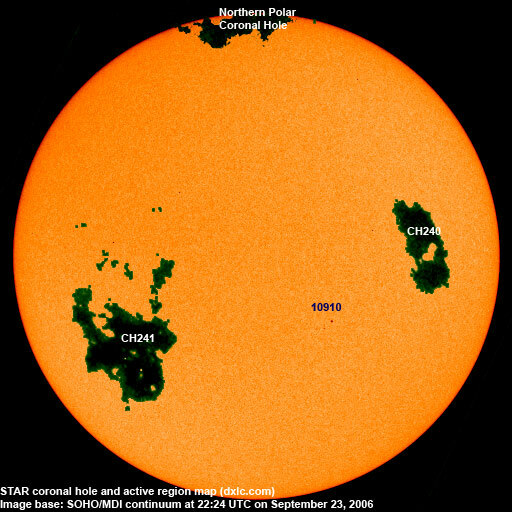 A recurrent coronal hole (CH241) in the southern hemisphere will likely be in an Earth facing position on September 25-27. The geomagnetic field is expected to be unsettled to major storm on September 24 due to a high speed stream from CH240 and quiet to active on September 25. Mostly quiet conditions are likely on September 26-27. Quiet to minor storm conditions are again likely on September 28-30 due to a high speed stream from CH241. Long distance low and medium frequency (below 2 MHz) propagation along east-west paths over high and upper middle latitudes is very poor to poor. Propagation was at times very poor with very weak signals from a few stations, then sometimes poor with fair signals from the most often heard Newfoundland stations. Propagation on long distance northeast-southwest paths is fair.